Estrella Z. Richter, 76, of Metamora, IL, formerly of Florence, Alabama, passed away at 5:15 pm on Sunday, August 19, 2018 at her residence. 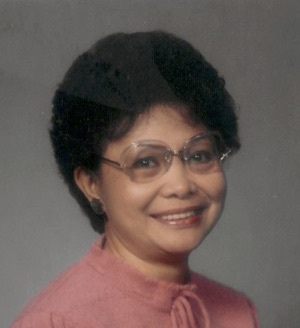 She was born on June 26, 1942 in Cebu, Phillipines to Rufino and Severina Zamora. She married Alfred Richter. He survives. Also surviving are her daughter Rowena (David) Reinertsen of Metamora; grandson Ryan Smith of Peoria; and three great-grandchildren Levi, Blake, and Scarlett Smith. She was preceded in death by her parents, granddaughter Danielle Jordan Smith, and sister Virginia Villa. Estrella was a former beautician and then attended college and received her degree in Business Administration. Her passion was gardening and she loved fishing, sewing, crafts, and travelling with her husband. The love of her life was her grandchildren whom she watched until they attended school. Cremation rites have been accorded. A Memorial Service will be held at 11:00 am on Monday, August 27, 2018 at Mason Funeral Home Metamora Chapel with Reverend Chris Genders officiating. Visitation will be held from 10:00 am until her service time on Monday at the funeral home. Burial of ashes will be in Chillicothe City Cemetery in Chillicothe, IL. In lieu of flowers memorials may be given to the American Cancer Society Central Illinois Chapter, 4234 North Knoxville Avenue, Suite B, Peoria, IL 61614. Online condolences at www.masonfuneralhomes.com.